Scraped knees and boo-boos abound. Becoming “blood brothers” by touching blood to blood, cut to cut might seem an innocent childhood rite. Teach your children about how to handle others’ blood (“Don’t!”). Blood, urine, and saliva should be treated with caution. They can harbor dangerous viruses. We know that hepatitis B virus (HBV), human immunodeficiency virus (HIV), and cytomegalovirus (CMV) can live in children’s blood, urine, and/or saliva. All of them can be transmitted by blood—blood from an infected individual entering the bloodstream of another. HBV and HIV would be extremely difficult to pass in saliva or urine (because the amount of virus there is so small), but CMV is known to spread both ways, especially in the daycare setting. 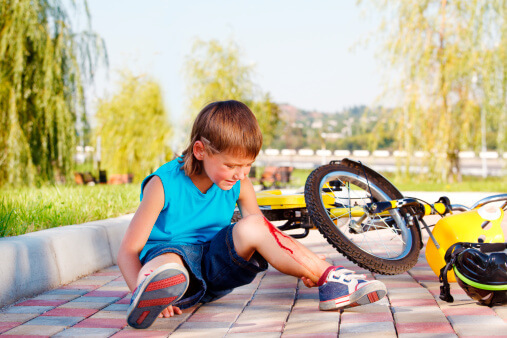 How can body-fluid transmission be prevented? Blood should be cleaned up by adults and not children, using disposable towels that are then placed in a plastic bag. Gloves are preferable. Avoid any contact with blood to breaks in the skin or to mucous membranes (mouth, nose, or eyes). Hands should be cleaned thoroughly after handling blood, and surfaces should be disinfected. Sharing of toothbrushes and drinks should be discouraged.